Hyères villas with pools to rent, luxury holiday houses for let, vacation rentals, letting homes, gites for hire, luxurious cottages, self-catering properties, child-friendly accommodation for family holidays in Hyères, Provence. Hyères Villa holidays are perfect for relaxing and enjoying a varied environment which includes the charming old town of Hyères, the flamingo salt flats lined with long wide beaches, the marina area by the port and the very pretty pine woods and creeks of the Presque Ile. Located to the east of Toulon, Hyères stretches over 30 kilometres from the top of the old town to the Fort Fondue at the end of the Presque Ile d'Hyères. Just inland the village of Solliès-Pont lies on one of the most fertile valleys in the area, it is known as the fig capital of France and holds the "Fête de la Figue de Solliès-Pont" during the last weekend of August. In the hills behind the village are numerous marked walks in the beautiful pine forests and each year major acts perform at the "Festival Festival Du Chateau" at Solliès-Pont. As well as being very varied the area is rich in flora, the palm trees here are amazing, huge, verdant and everywhere, even on the roundabouts. 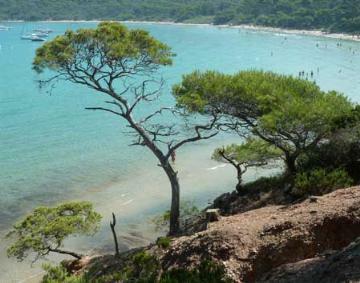 An added bonus is the three islands just off the coast, the biggest one, Porquerolles is just 15 minutes on the ferry. It is a great place for cycling and walking and the beaches are quite stunning. Marseilles Airport (MRS) is the nearest international airport 90km. Nice Airport (NCE) is 144km, nearly all motorway, it normally takes an hour and a half. For self-drive holidaymakers, there is excellent motorway access most of the way. The climate in Hyères is wonderful, rather like the tropics from April to October, hot in July and August with little rain. We have 0 villas in Hyères. The old town of Hyères is charming; it starts as a pedestrianised area at the top of the main town and works its way up the hill via a beautiful square full of outdoor cafes and restaurants. There are delightful shops selling Provencal wares along with practical ones such as the boulangerie and an ice cream parlour! Further up the hill, there is a very nice botanical garden which commands fabulous views of the Presque Ile below. The centre of the Presque Ile is dominated by salt flats which are inhabited by many birds including pink flamingoes. It's rather like a mini Camargue. Along the western leg of the Presque Ile is a long dune which is backed by parking spaces and there is a very long wide sandy beach on the other side, there are no buildings and it is reputed as one of the best in the area. On the east side, there are houses and some villas, about three streets deep, before you get to the beach, which is equally long. Half way along the east side is the marina and port, a smart area with yachts, outdoor cafes and restaurants. At the foot of the Presque Ile is the very pretty wooded, hilly area with gorgeous Mediterranean pines, little ports and creeks along with a lovely area for traffic free walking. 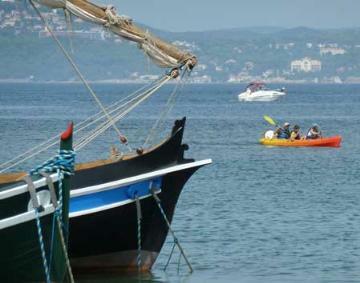 There are lots of opportunity for boat, bike and jet ski hire or even kayaks. It is the sort of place where you can really enjoy the sea when you're not languishing by the pool of your Hyères Villa. Hyères villa holidays offer you the opportunity to discover Hyères old town, the Presque Ile, numerous beaches, flamingo salt flats and the islands, including Porquerolles, at your leisure.